Governor Darius Ishaku has approved the composition of transition and stock taking committees to ensure a smooth transition. A statement by the Chief Press Secretary to the State Governor, Hassan Mijinyawa says Ambassador Idris Waziri would serve as the Chairman of the transition committee. 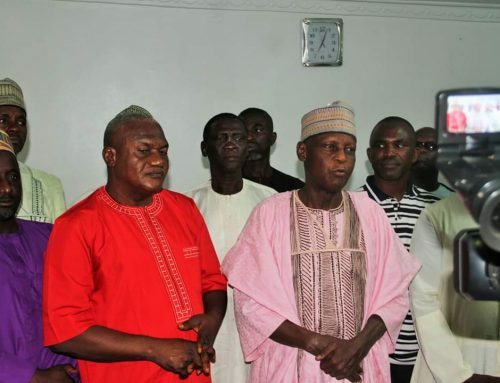 Members are Speaker of the Taraba State House of Assembly, Abel Peter Diah, Edward Baraya, Anthony Jellason, Gebon Kataps, Victor Bala Kona,and Simon Dogari. Other members are Yusuf Nya Akirikwen, Jesse Ashumate, Innocent Vakkai, Johannes Jigem, David Ishaya, Alhassan Hamman Gassol, Lois Emmanuel, Simon Angyu, Aminu Jika and Alfred Yahaya Kobiba. It further stated that Agyo Nwuneke, Abubakar Bawa, Fatima Hassan, John Mamman, Philip Duwe,Tukura Bashir, Peter Gambo, Stephen Agya and Jovita Shafe would also serve as members while Isah Hassan is to serve as Secretary with Sunday Maiyaki and Abdulkadir Abubakar as Co Secretary one and two. According to the statement, the Stock taking Committee would be chaired by the Commissioner of Works, Irimiya Ibrahim Hammanjulde and Jerome kamai, Suzzy Nathan, Musa Obadiah, Sam Ada and Permanent Secretary Ministry of Rural Development, Danjuma Bujujen as members. Other members are Polycarp Iranius, Jonah Magaji Siman Ambita, Aminu Ayuba, Benjamin Ibisu and Ezekiel Polycarp. Augustine Sholanko would serve as Secretary while Aliyu Sarkin Noma, Columbus Garba Umar andEnganya Samaila stand as Co Secretary one, two and three respectively.